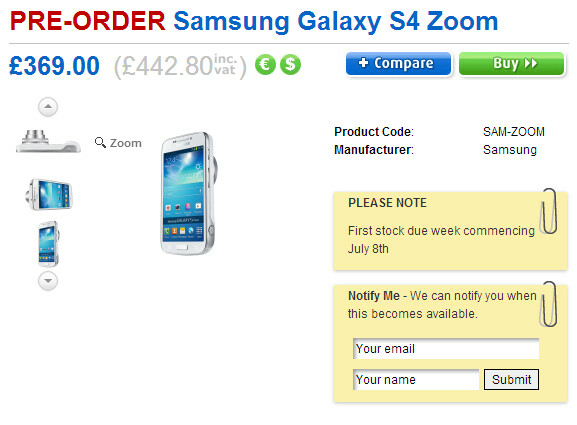 Slowly, a picture of when the Samsung Galaxy S4 Zoom will launch in the U.K. is coming into focus. According to U.K. retailer Clove, the camera centric device will be released on July 8th. Clove is accepting pre-orders for the model which will sell for a price of 369 GBP ($563 USD) before tax once released. The unit brings some new and unique functionality to Android. The Zoom Ring on the device is the ring around the lens. When twisted, it adds more options to the ones currently on-screen. Another interesting feature allows you to twist the Zoom Ring while on a voice call to automatically send an MMS picture to whomever you are speaking to. 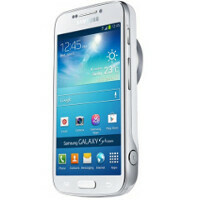 The Samsung Galaxy S4 Zoom features a 16MP sensor on back with an optical 10X zoom and Optical Image Stabilization. This is not a device for those who have small hands or like to carry their phone in a pants or shirt pocket. The camera is 15.4mm thick and with the lens, that rises to 25mm. To put that figure in perspective, the Huawei Ascend P6 is the thinnest smartphone at the moment with a 6.18mm thickness and you can fit four units of the Huawei model into the Galaxy S4 Zoom. this is like putting a brick inside your pocket . . .next! How many (4x) photos you must loose until you can compare to ONE photo taken with S4 zoom ???? i was waiting for the Note3... but now i want this more?